Between the Grandi Magazzini di Settimio Severo and the Terme della Lanterna, magnetometry revealed an open space or courtyard (c. 60 m by 40 m) surrounded by ranges of rooms. 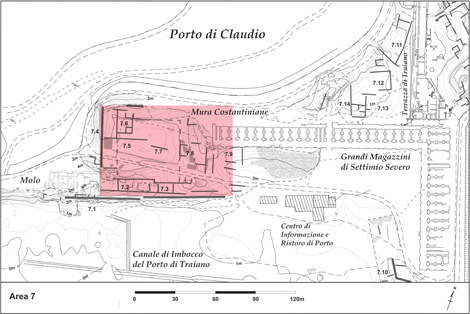 In the northwest corner, there is a distinct rectangular structure (c. 12 m by 15 m) with additional room divisions. The function of this building remains unknown, though its general configuration is somewhat reminiscent of traditional warehouses (horrea) found in Ostia.